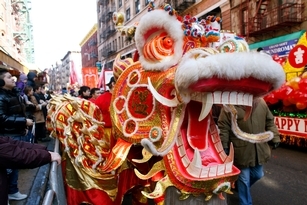 Come celebrate the Year of the Pig in New York City! No matter what your background is, everyone is welcomed! This Sunday, February 17 at 1 p.m. come out of your house to welcome the Year of the Pig in New York City! One of the most festive days of the year for everyone, no matter what your background is! You can expect the streets of Chinatown to be filled with colorful floats, lion and dragon dancers, marching bands, martial art performances and that is to say least! Pfft, you thought the Gregorian New Year was incredible, wait until you this massive street party! To top things up, after you’re done enjoying the parade, make sure to check out other delightful things to do in that area like karaoke, dinning at a Chinese restaurant and more! I mean, if you’re going to celebrate, do it well!